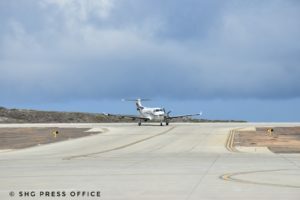 ‘We must be crazy’ writes Captain Jack Long on his blog and who, along with his wife Carolyn and their friends Becky and Josh, arrived in his Pilatus PC-12 (a single propeller plane) at St Helena Airport at 3.22pm on Thursday, 17 January 2019, on their third trip around the world. The group has circumnavigated the Pilatus PC-12 twice – once in an eastbound direction (2015) and once over a very challenging polar route (2016-2017). This third trip is another variation of a ‘Round the World’ flight – Circumnavigation Westwards – recognised by FAI (Fédération Aéronautique Internationale). St Helena is one of the stops in the ‘grand finale’ of Jack, Carolyn, Becky and Josh’s epic journey before they return to Austin, Texas where they set out from two months ago. By the end of their trip, the group will have clocked up around 25,000 statute miles, 20 flying days, and visited places such as Costa Rica, Ecuador, Peru, Chile, French Polynesia, New Zealand, Australia, Singapore, Indonesia, the Maldives, Seychelles, Botswana, Angola, St Helena and Brazil.